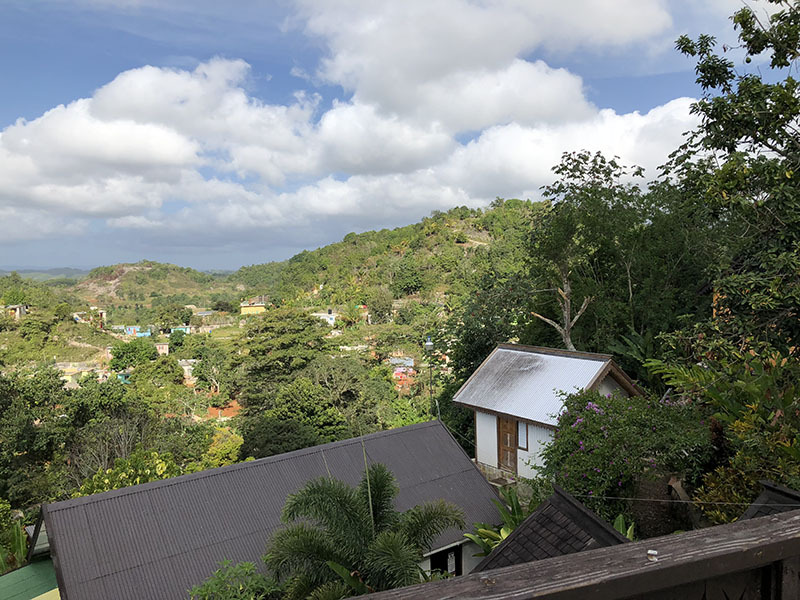 Attorney Michael Santucci recently visited Nine Mile in Saint Ann, Jamaica, the birthplace and now resting place of the musical and spiritual legend Bob Marley. 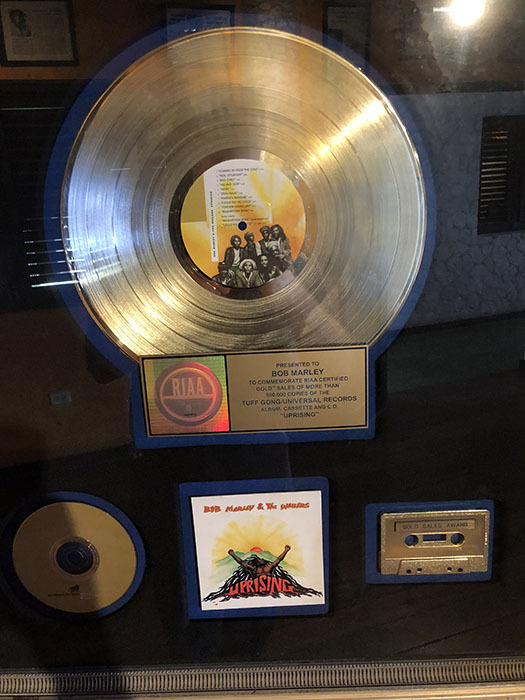 His gracious host, Richard Booker, is Bob Marley’s brother and a long-time client of Santucci Priore, P.L. with whom Michael stayed on the family compound. 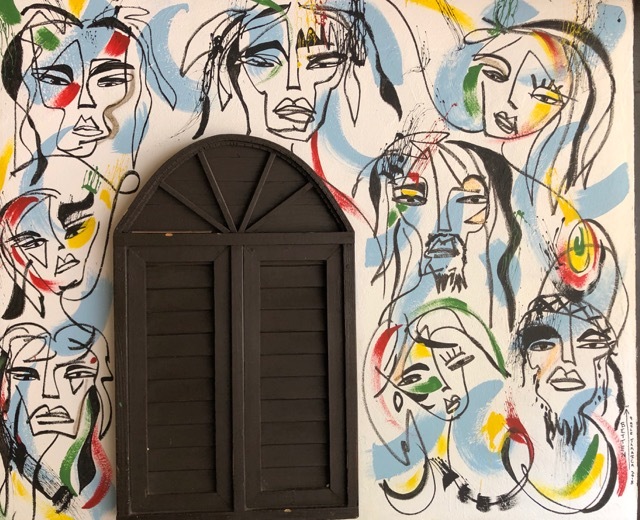 People travel from all parts of the earth and make the pilgrimage into the mountains to Nine Mile seeking music, peace, enlightenment, solitude and to pay their respects to international legend Bob Marley and his mother, musical artist Cedella Marley Booker. 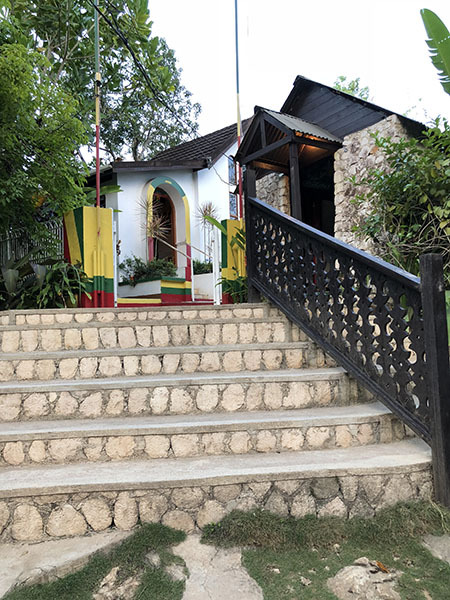 Richard Booker welcomes all, and offers respectful, private tours of his home and compound, including the family mausoleum where both Bob Marley and their mother Cedella Marley Booker was laid to rest. Michael Santucci is forever grateful for the hospitality shown by Richard Booker, his family, friends and staff. The food was yummy, a little spicy and included sushi-chef-cut succulent garlic lobster tail skewers, Caribbean-spiced shrimp, curry stew, jerk chicken and lots of veggies. The entire line of Cedella Marley Booker’s Smilin’ Island sauces, rubs and other food products were on hand to taste and purchase. 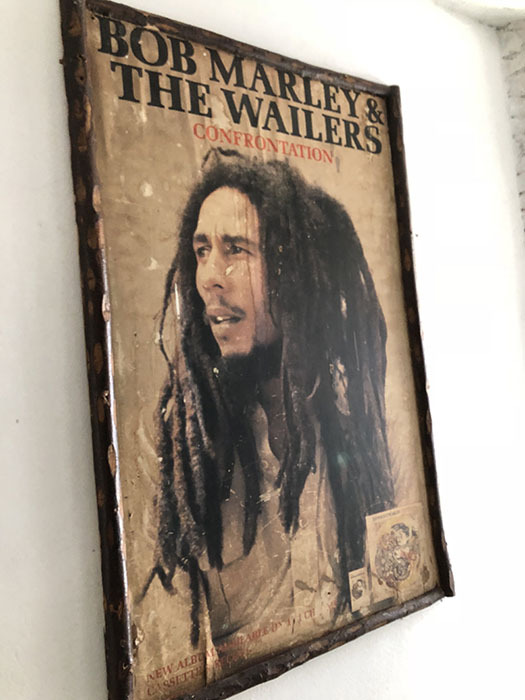 The line consists of family recipes of Bob Marley’s mother, Cedella Marley Booker including various hot sauces, seasonings and Santucci’s favorites, the East Indian Spice Seasoning and the Reggae Ketchup. A director and videographer was also shooting some hilarious commercials for the Smilin’ Island food products at the same time. Buy them all here. Richard Booker runs, as he historically did with his late mother, Cedella Marley Booker, the Nine Mile Music Festival in Miami and annual food drive every year. 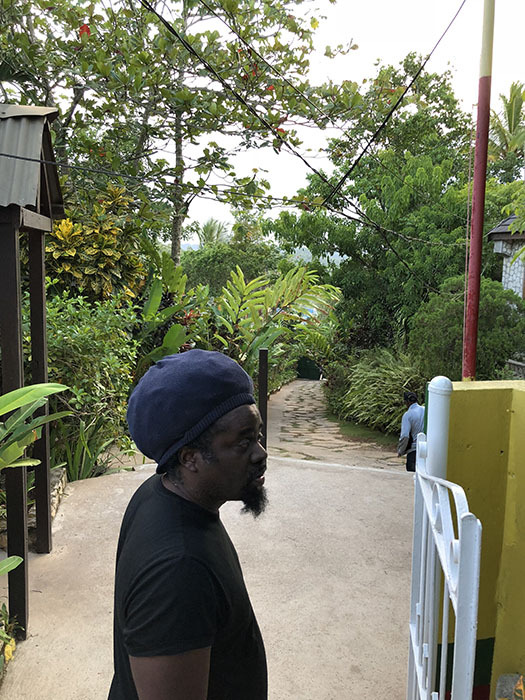 Regular performers include, Bob Marley’s sons, Julian Marley, Damian Marley, Stephen Marley and Ky-Mani Marley as well as Artists like Lauren Hill, Shaggy and Seal Paul. The festival is usually held in February or March each year. The festival/food drive has fed over 1,000,000 hungry families. Check it out here. Thank you once again to Richard Booker for his hospitality, grace and generosity. Blessings and respect. 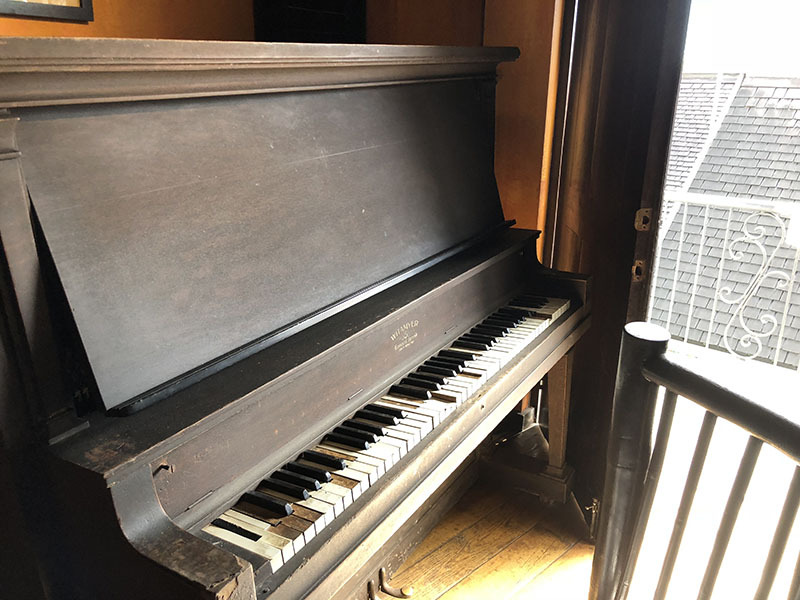 Piano that Bob Marley played and grew up with in his childhood home. Richard Booker walking back down the hill from the mausoleum. No photos or video is permitted inside the mausoleum. The room where Bob Marley slept as an infant with his mother Cedella Marley Booker. 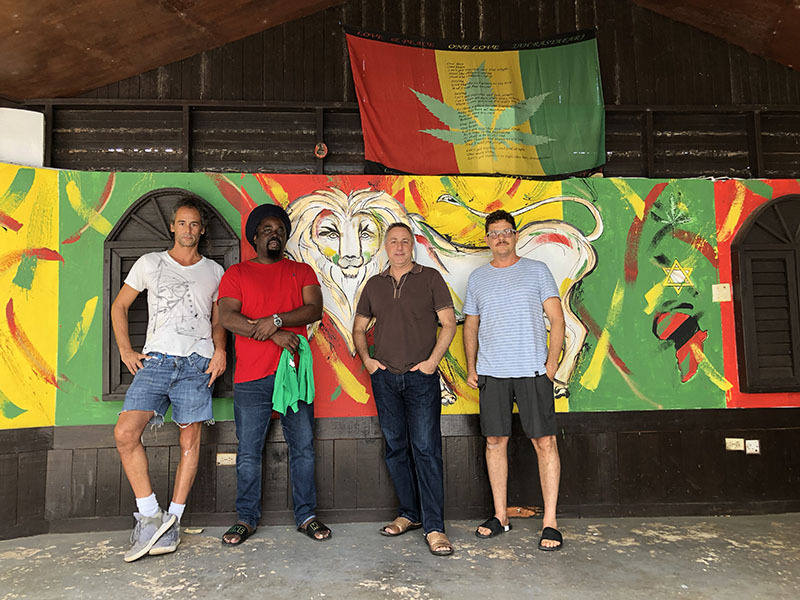 L to R: Wynwood Walls artist Jordan Betten; Richard Booker, Michael Santucci and Miami entrepreneur, investor and music curator Joe Risolia posing for a photo upon the completion of Betten’s newly- painted mural on the Nine Mile stage. 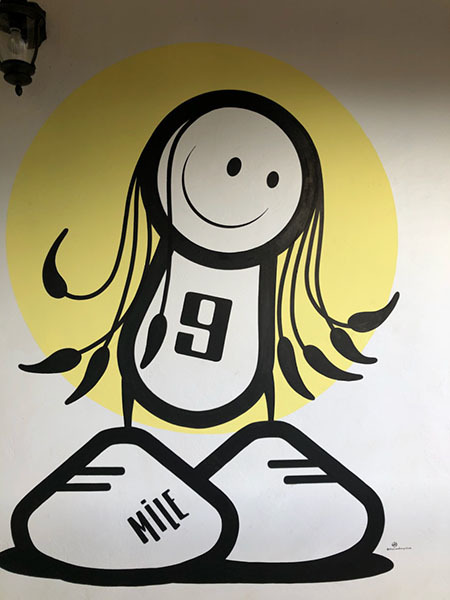 Newly-created Nine Mile artwork by Chaz. Part of the new Nine Mile stage mural by Jordan Betten of Miami. It was fascinating to watch this work or art in progress through to completion.